The ex-Wolves and Sunderland boss is the longest-serving manager in the division, having arrived in 2012. The 59-year-old guided the Suffolk club to the play-offs in 2014-15, and the Tractor Boys are 12th in the table. Earlier this month, McCarthy insisted he would not leave before the summer despite criticism from some fans. He met Ipswich owner Marcus Evans on Wednesday, with the pair deciding a change was "in the best interest for all parties". "In his six years here he has made us a very competitive club in what is a very competitive league. No-one looks forward to playing Ipswich. McCarthy's assistant Terry Connor will also leave Portman Road after their final game against Middlesbrough on 6 May. 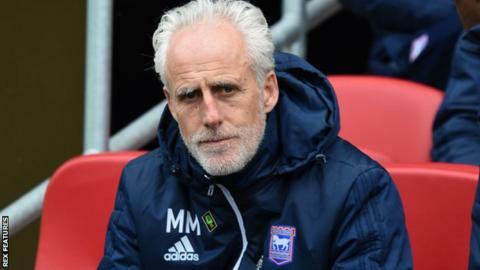 "I had a good discussion with Marcus and we feel this is the right thing to do for me and for Ipswich Town," said former Republic of Ireland manager McCarthy. Speaking at his news conference before Saturday's match at Birmingham, where McCarthy started his Ipswich reign, he hit out at supporters who he claimed had "ruined" home games this season. Asked if he had been given the respect he deserves for taking the club to the 2014-15 play-offs, he told BBC Radio Suffolk: "You'll have to ask the numbskulls who've been giving me the abuse, because I think that's what they are to be quite honest. "But no chance, I was never going to pack it in and she knew that." Ipswich captain Luke Chambers said the squad did not want McCarthy to leave and believes his "hands have been tied" by budgetary restraints. The East Anglian club are 10 points from the top six, but 19 points clear of the relegation zone, with eight games to play. Chambers told BBC Radio Suffolk: "We're very disappointed to see him go as a squad, we wanted him to stay there's no secret about that. "We haven't made the play-offs, so yes, we probably have let him down, but whether we have any given right to be up anywhere near the play-offs is another question for another day. "I don't want to always talk about money but yes, I do feel his hands have been tied a little bit. "It probably shouldn't have got to this point. Things maybe should've been a lot clearer sooner and decided which way we were going to go." I think the players will be gutted. I think there's a really good connection between the manager and the players. I see that, they stick together - but you can tell with the manager and the fans that it wasn't there. Whoever comes to this club, if he gets a bit of money, he's still got the basis of a good team. A lot of these boys are good players and I think, with just a bit of extra money, we'll be all right.